Characters: Califfa Vanessa Al Saugren min Ch'Thier, Eddy the Mage, Queen Anna of Shallmar, Runtherd "Runt"
"Eh, kids! What do they know?" The actual tomb of Ch’Thier. However with what he was told last page, he became crest fallen. my comment was to you Aaron but I made a tactical mistake when I first posted. Ah ok, so Eddy felt they could enlist the aid of Ch’Thier but didn’t know of her condition. I kinda thought he’d know that already. Resting place is a bit of a hint, meaning, inactive. 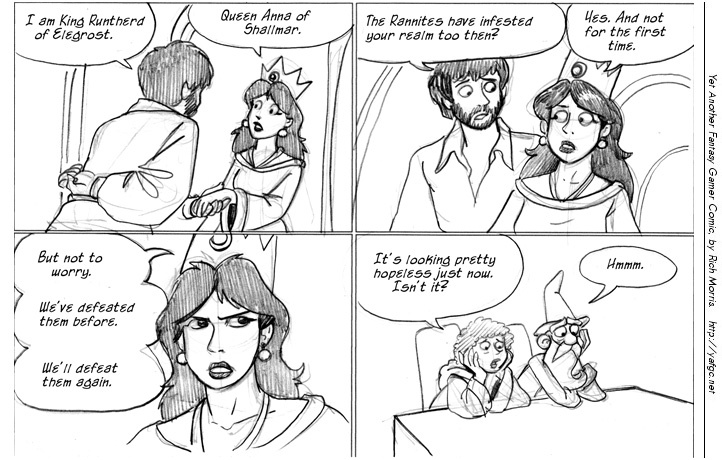 I know that just because her mortal form is inactive doesn’t necessarily mean the Goddess is, but if Eddy knows Ch-Thier’s relationship with her sister, Ranna, then he’d know she wouldn’t be idle or rely solely upon requests from mortals. I guess he had to hear it straight to accept it though. Still, feels like he was hoping beyond hope which is something I wouldn’t expect from his character. Maybe he’s looking at things from a purely mortal view, i.e. you always have to ask the Gods for everything, and not considering that they will take action upon their own volition. Well, Ranna couldn’t wake up on her own either, right? She had to be near her body, othwerwise she wouldn’t need to look for it at the first place. Of course, that could have been a side-effect of her "condition" as well, but it also could be, that’s just how it works. Ch’Tier might also need to be present at some form, and might requires the help of mortals to do so -through summoning for example. These are merely speculations, but if thats how it is, Eddie could have think that they hit the checkpot, and whoever were there just didn’t know how to summon her. What he might does. But, even if it works differently, it is likely that she can’t just wake up on her own, thats why Vanessa and co went there as well. That may not actually be a palatable option, what with Ranna apparently controlling the afterlife…..
I’ve been in this position more times than I care to think about: "No sense in letting the others know yet how screwed we are." Fortunately, Fake It Til You Make It actually works. That’s basically the secret to adulting. (A) Ship gets damaged by a larger, superior force. (B) They turn for help to people who live in the clouds. (C) Somebody important is in suspended animation. I’ve got Leigh Brackett on the phone; she’s very excited about where this might be going. If we see Eddy in a slave outfit, I’m blaming you, t!, for putting that thought in Rich’s mind! Force ghost. Happens all the time. That’s just something she tells people. Hopelessness is just that point in your life that’s about two minutes before "Just crazy enough to work" becomes less "CRAZY" and more "WORKABLE". Is the king’s name pronounced "Runt Herd" or "Run Third"? Like "Run Third". But no pause between the syllables.